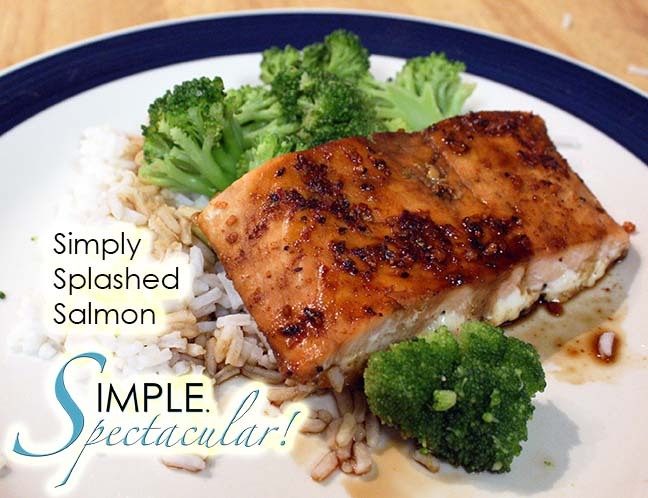 Simply Splashed Salmon Recipe | Simple. Spectacular! So fish is one of the things I love to cook, simply because I don’t have to cook three different entrees to please the family! My go-to meal for omega-3 fatty acids (which seems to be a serious buzz word for nutrition experts these days), protein and vitamins is this Simply Splashed Salmon. I came up with this combination by trial and error. 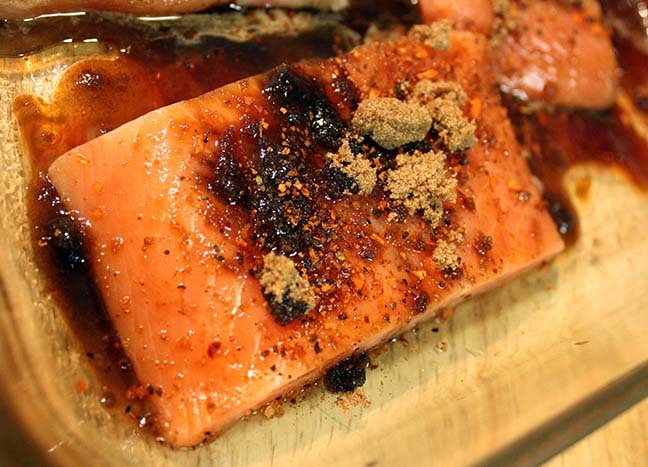 I think this is the perfect savory salmon, with just a hint of smokey sweetness. I start with wild-caught salmon. (Sustainable, wild-caught fish is not only better for the ocean, it’s also better for you… So make it a priority to buy wild-caught, unless you have an unnatural attachment to antibiotic-fed, pesticide-sprayed swimmers for some reason!) Fresh fish would be fantastic, although I typically start with frozen, since I’ve found it to be more budget friendly. Ideally, you’ll want to leave the fish in the fridge the night before. (If you’re like me, you’ll forget the night before. So, yes, running it under cool water to defrost is great too!) Then grease a glass baking dish, and place the defrosted salmon inside. I lied in this photo. I’ll confess, but I’m not sorry. Start splashing with the wet ingredients – lemon juice, low-sodium soy sauce and Worcestershire sauce (knowing how to pronounce that last ingredient is also a prerequisite of New Endland residency. I haven’t mastered it. Hence, we don’t live there.) 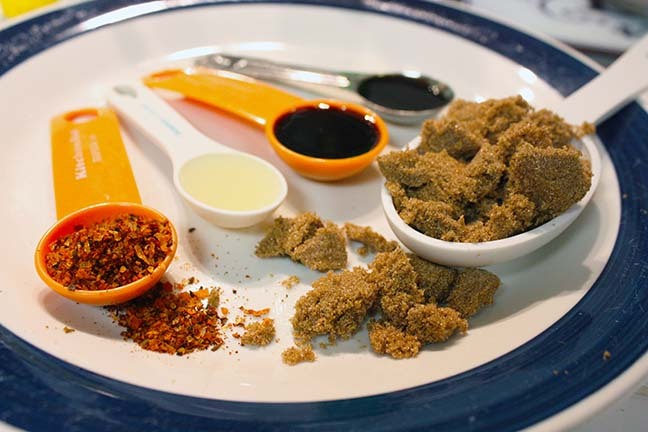 Then finish with the crumbles – a bit of brown sugar and a sprinkle of mesquite seasoning (I use McCormick Grill Mates). At this point, it’s awesome if you could pop the splashed and sprinkled salmon into the fridge for an hour or two to let all those distinct flavors mingle and get to know each other. But again, if you’re like me, you’ll need to serve dinner in less than half an hour, so you’re allowed to just skip this step. Just throw the whole dish full of flavors (who are now only acquaintances, but they will surely cozy up to each other) in the 375-degree oven. Cook the fish for about 12 minutes, or until it’s cooked through and flakes easily with a fork. I like to serve it with rice and steamed broccoli. You can drizzle some of the sauce from the pan over the whole dish. Yum! Grease a glass baking dish, and place salmon inside. Top with liquid ingredients, followed by the dry ingredients. Bake in preheated 375-degree oven for 12 minutes or until fish is cooked through and flakes easily with fork. Drizzle sauce over fish on plate to serve. If you happen to have leftovers (although my guess is, you won’t! 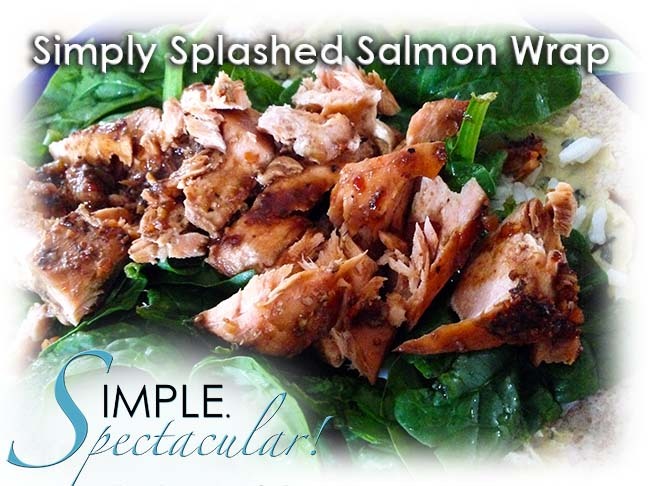 ), my favorite meal to make this into is a Splashed Salmon and Greens Wrap! Top a whole-wheat wrap with your favorite hummus, warmed leftover rice, torn spinach and heated and flaked leftover salmon. Makes a great second-day lunch, and your taste buds won’t be bored of it either, I promise!